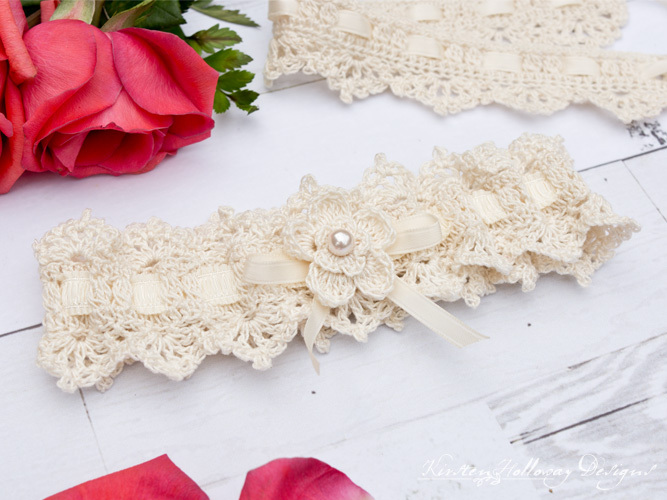 The Wrapped in Lace garter is a beautiful, free crochet pattern for the bride on her special day! Weddings can be expensive, but they don’t have to cost as much if you crochet your own bridal accessories! 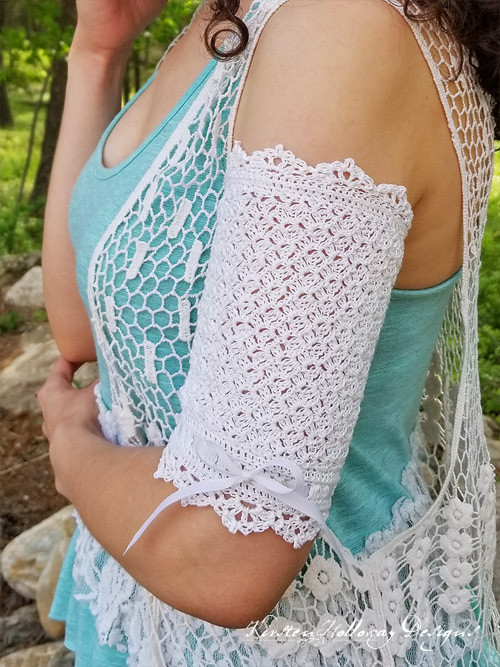 This crochet wedding garter matches the Wrapped in Lace Choker, and Fingerless Gloves crochet patterns to make this a complete bridal set. 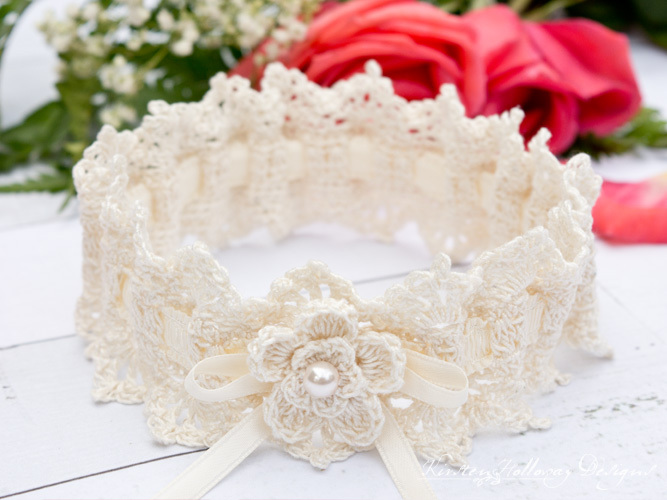 Delicate lace details, and a simple flower with pearl center give this set a vintage or Victorian era feel that’s perfect for country, or romantic style weddings. While I’ve displayed these pieces with a cream ribbon, it can be swapped out to match the bride’s colors if you prefer. As written this pattern fits a XS-M, but additional notes are provided so you can adjust the pattern up as much as you need. I don’t know if it’s just me, or if this is common among little girls, but when I was very young I always enjoyed looking through a small treasure box of things my mom had saved over the years. One of those items was her wedding garter. It was lacy with a blue satin ribbon and I was always impressed by how beautiful it was (I have loved beauty as long as I can remember). 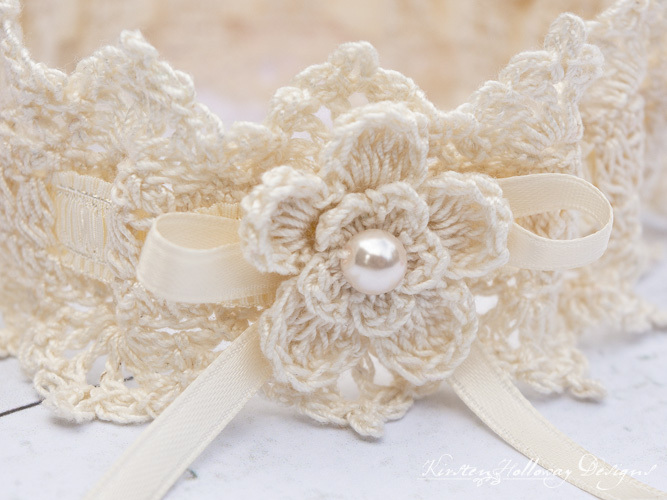 I knew that some day when I was old enough to get married, I wanted a beautiful garter like that! While this garter does look quite a bit different from the one my mom had, I’ve tried to capture some of the same wonder and grace in this pattern. I hope this brings out the dreamer in your heart on your big day, and becomes a treasured heirloom for you and your family for years to come. 1.5mm steel hook. I suggest trying Clover Amour Hooks for a comfortable crochet experience. XS-M: 18” around before elastic band is added. See “Additional Notes” for increasing the size. -You may substitute ribbon for the elastic band if you prefer. 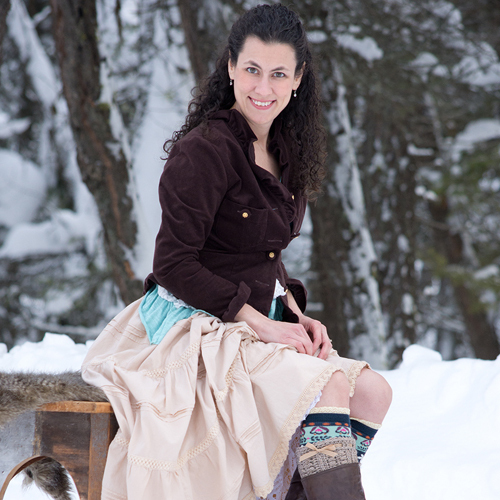 -This garter fits up to a 18” leg (measuring circumference 1″ above the knee) as written. Round 1: Ch 144, join with sl st making a circle. Be careful not to twist the chain! Round 7: *ch 3, sl st into ch-1 space, ch 3, sl st into next ch-1 space, ch 4, sl st into same ch-1 space, ch 3, sl st into next ch-1 space, ch 3, sl st into final ch 1 space, move to next ch 3 space, sc, ch 3, sl st back into sc creating a picot, sl st into first dc of next shell; repeat from * around. Attach crochet thread to other side of garter. Repeat rounds 5-7 one more time. Block the lace if you wish. Measure your leg circumference 1″ above your knee. Cut length of elastic 1″ shorter than your leg circumference. Weave elastic (or ribbon) through round 3. Sew ends together securely with needle and thread. You’ll need about 3/4″ of overlap when you sew the elastic ends together. Thread ribbon around 2 clusters and tie in a bow. Take your needle and thread and secure bow with a stitch or two so it doesn’t untie. Sew delicate flower on top of bow. Feel free to use a different flower if you prefer, or replace it with a cameo embellishment if you prefer. And that’s it! Congratulations on your upcoming wedding! I wish you well as you begin your journey as a married couple! This post may contain affiliate links. When you purchase something using these links a small amount of the sales price goes to me. However, you do not pay any extra for the item you purchase. How cool is that?! I love this garter! I have been looking for a specialness for my sister-in-law to be to given in her wedding day and this is perfect!!! Imma making it up in ivory and blush pink as those are her colours and during a rose quartz bead instead of the pearl. Will be a challenge though as I have never worked with so fine a thread before and have not used uk terminology too,but as I love this so much in giving it a go! What a sweet gesture of kindness from you! I hope your sister-in-law loves it! The pattern is written in US terms, not UK terms. Can the pattern be worked flat, in rows, as opposed to in rnds ?? Then sewen ? Oh, how absolutely gorgeous! While it is rather ahead of time, I think I will make and put away for my grandsons’ brides for when the time comes for them to be married. When I was married we threw the garter to the bachelor guests on the same premise as throwing the bride’s bouquet. Wish I’d got duplicates of both to keep. Thank you. I am creating this for a friend as a keepsake as well as a beautiful present. I am just waiting for the cotton to come through and I am hoping I may be able to do the choker for her too. How sweet! I’m sure she will love it! Will you be doing a bridal wrap in this style? Making this for my sister-in-law. I’m on round 3 now, but it seems much too small for 1/2” elastic to fit. What am I doing wrong? Your gauge may be too tight. Try going up a hook size or making your stitches taller.